The season of good cheer–and good food–has begun, but there are many who are left out in the cold. Share the abundance; volunteer your time, your food, or your funds (or all of the above) to help spread real warmth to all New Yorkers. We’ve rounded up Thanksgiving volunteer opportunities around the city to make it even simpler for you to give back. You can send a written message to one of the elderly New Yorkers to whom this much-needed organization will be delivering a hot Thanksgiving meal; Your note will be delivered along with the holiday dinner. Thinking ahead? They’re also looking for Volunteers for Christmas or New Years Eve and Day meal service at Citymeals On Wheels in Manhattan, Brooklyn or Queens. With just a little of your time, you can nourish a homebound elderly person with a wholesome meal and the joy of your company. This volunteer-run organization collects potluck meals, toiletries and blankets and delivers hot meals and care packages to the city’s homeless on Thanksgiving Day. Volunteer needs: kitchen crew, conveyor belt crew, food boxers, vehicle coordinators, drivers and cleanup. Kids are welcome if they’re with an adult. Volunteers are asked to bring a preheated potluck dish, toiletries or blankets to donate. Time slots are filled on a first come-first served basis. The event happens at the Church of the Intercession, 550 West 155th Street near Broadway on Thursday, November 27; early bird time slots begin at 7:30AM; all other shifts start at 10AM. Email [email protected] with any questions. Give instead of acquiring on Black Friday: Donate gently used winter coats to the New York Cares coat drive, happening from November 17 through the month of December. 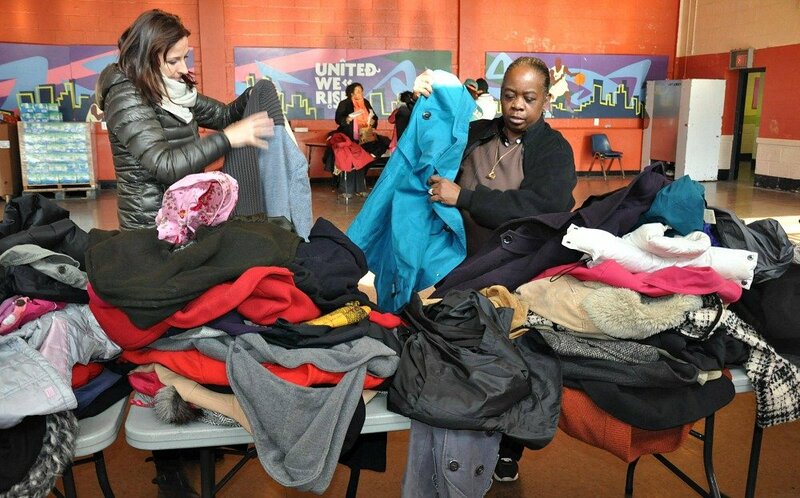 Dropoff locations are at the New York Cares Coat Drive Warehouse (157 West 31st Street) between 9am and 4pm weekdays or at one of 280 local collection sites. You can even buy a coat on Amazon have it shipped straight to the warehouse. Bed-Stuy soup kitchen Neighbors Together serves 30 lunches and dinners between Thanksgiving and Christmas during their 30 Thanksgivings campaign. You can donate as a group and volunteer to serve the meal you sponsored or you can give smaller donations individually. For information email [email protected] or call 718-498-7526. Flatbush food kitchen CAMBA wants to give 500 turkeys to 500 families in need. They’re rasing money on Indiegogo (they’re trying to raise $15,000). Each $30 buys a turkey with all the trimmings and sides. For those leftovers, CAMBA runs a regular food drive with several dropoff locations throughout Brooklyn. Drop off canned and dried food and juices or make a financial contribution. Help the West Side Campaign Against Hunger provide low-income families with turkeys and other food for Thanksgiving dinner. Make a financial contribution ($18 per turkey) or donate a frozen turkey. You can contribute online or bring checks and turkeys to the donation site at the lower level of the Church of St. Paul & St. Andrew, 263 West 86th Street between Broadway and West End Avenue on November 24, 25 (9AM-8PM) and 26th (9AM-noon). There’s a Gristede’s market right next door so you can purchase your turkey right there. If you have some spare time, pitch in for baking duty and crank out some pies or muffins for the Thanksgiving feast at the Episcopal Church of the Heavenly Rest on Fifth Avenue at 90th Street in Manhattan. If you can volunteer to help prepare and serve the meal, preparations begin on Wednesday, November 26 beginning at 10AM to help prep and to set up. On Thanksgiving Day (November 27) help is especially needed from 2 to 4PM to help clean up after the meal. Serving will begin at 12:15PM. Call 212-289-3400, ext. 200 or email [email protected] to volunteer. On the Wednesday before Thanksgiving, Greenpoint Church will host a food pantry from 2-5PM and a large community dinner from 5:30-7PM at 136 Milton Street in Brooklyn. Both of these events run on volunteer power. If you’d like to sign up for one or more shifts please see the online signup. Volunteers can cook, set up tables and chairs, serve dinner or clean up. Kids over five are welcome. These fine folks also host a community dinner every Wednesday and run a food pantry each Thursday, so your efforts don’t have to stop when ‘tis no longer the season. Questions? Email [email protected]. FeedingNYC connects with families in need throughout New York City. 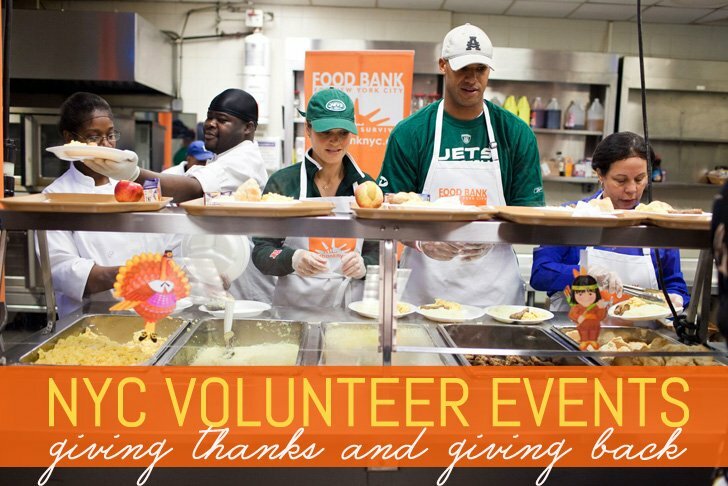 Each year, FeedingNYC hand delivers nearly 3,000 Thanksgiving dinners. Thanksgiving dinners are delivered to families who are in partnership with Women in Need, Jewish Federation, Catholic Charities and City Harvest. How you can help: Donate–sponsor a meal box or make a recurring gift and get 10% off at Manhattan Mini-Storage. Volunteer–to pack and deliver thousands of Thanksgiving meals to local families and shelters. Because Ebola (and lots and lots of other awful diseases) doesn’t take a holiday, the brave ranks of Doctors Without Borders give up theirs to provide medical care to crisis-struck communities around the world. Park Slope bar Skylark at 477 Fifth Avenue is donating 10% of all weekend sales throughout the month of November to the organization.